Arlington Pond, also known as Arlington Mill Reservoir, is located in the lovely town of Salem, NH. This 250+ acre pond is a great place to swim and boat and the real estate on Arlington Pond includes a wide range of single family homes. Salem, NH, is conveniently located along I-93 just over the MA/NH border. Discover life on Arlington Pond. 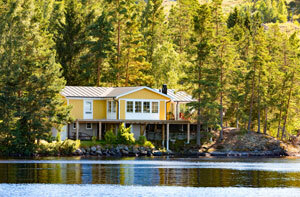 You may also be interested in viewing available Southern New Hampshire waterfront homes. Interior Elements A rare find with scenic water views in the desirable Arlington Pond community. This cozy year-round home sits across from the pond, with two bedrooms, plus an additional room with a closet for an office, home gym, or guest quarters. Natural sunlight fills the open concept living and dining area. Bright kitchen with abundant cabinets and counter space. Bedroom, bathroom, and laundry are on the main level. Plenty of closets and storage, with additional storage in the lighted attic space. Step Outside Kitchen has direct access to the rear deck with room for a grill and patio set. There's a large level, private back yard with a storage shed, and paved driveway with off street parking. This quaint lake community is convenient to excellent schools, tax-free shopping, local dining, pubs, and a golf course all close by, and less than an hour to Boston, scenic NH Mountains & Beaches. Walking distance to the private community beach. Enjoy summer and winter on the lake for $25 annual APPA dues. More info at the site for the Arlington Pond Protective Association. I have a question about the property at 122 Shore Drive Salem NH 03079 (#4739082). I would like to schedule a visit for the property at 122 Shore Drive Salem NH 03079 (#4739082). I have a question about the property at 203 Shore Drive Salem NH 03079-1641 (#4736841). I would like to schedule a visit for the property at 203 Shore Drive Salem NH 03079-1641 (#4736841). "Outstanding Year Round Waterfront Home on Arlington Pond! " "Features Panoramic Views of Arlington Pond " "Lower Level Offers In-Law Potential with walk out and separate entrance." Home Offers Updated Bathrooms ,Kitchen with Granite Counter tops, tile flooring and Stainless Steel Appliances,Freshly painted interior walls, Combination of Living and Dining Rooms gives it the Open Concept Feel with Breathtaking Views of Arlington Pond and the Brick Hearth Fireplace makes it Super Cozy,enjoy newly installed Storm Doors off Kitchen & Living Room Entrances.New Carpeting in Lower Level featuring 3 Finished Rooms and Stone Hearth with Wood Burning Stove in Fireplace, Plenty of Windows facing the Pond with walkout to Patio and Grassed Fenced area for family fun .Spacious Master Bedroom with Sitting area overlooking the Pond and Large custom Closets with built ins. Private Dock for full water access including Boating and Swimming and all your water activities,Trek Raft and Dock ,Outdoor Fireplace and built in Bar Area with Huge Deck off Living/Dining Great Room.Out Building/Shed for storing all your water fun accessories.Large Wide Driveway for parking and Boat Storage.Truly a one of a kind Waterfront Home offing a flexible floor plan with plenty of room to grow or for house guests on the weekends of Summer Fun with lots of extra closet space throughout the home. I have a question about the property at 169 Shore Drive Salem NH 03079 (#4726025). I would like to schedule a visit for the property at 169 Shore Drive Salem NH 03079 (#4726025).